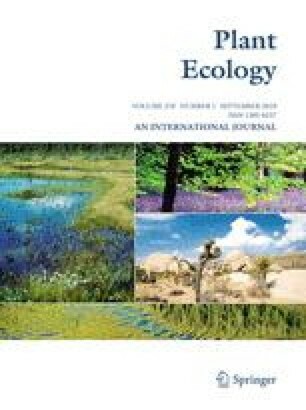 Regeneration processes of riparian Robinia pseudoacacia forests after clear-cutting were investigated through dendroecological and microsatellite polymorphism analyses. Age determination of regenerated R. pseudoacacia trees based on the dendroecological analysis revealed that forests regenerating after clear-cutting were composed of trees that mostly established within a few years after clear-cutting. This suggests that the stimulus to form new shoots was evoked by clear-cutting but faded within a few years. Genet identification via the microsatellite polymorphism analysis showed that ramet trees belonging to the same genet were distributed in a cluster. Almost all trees regenerated asexually through new ramet formation on the cut stumps and residual horizontal roots after clear-cutting. AMOVA with microsatellite markers showed that among- and within-population variations contributed 6 and 94% to the total variation, respectively, suggesting that R. pseudoacacia trees in the forests were initially established from seeds dispersed randomly from mother trees in a wide area. We thank the staff of the Chikumagawa River Office, Ministry of Land, Infrastructure, Transport and Tourism for their invaluable help, including logging the R. pseudoacacia trees in the field, and members of the Laboratory of Forest Botany, the University of Tokyo, for various help and support in both the field and laboratory. This study was supported in part by a Grant-in-Aid for Young Scientists from the JSPS (No. 6167) to HK, and a Grant-in-Aid for Scientific Research (S) from the JSPS to TH.